The Amherst Chapter of Phi Gamma Delta was chartered in 1893 (King, 151). 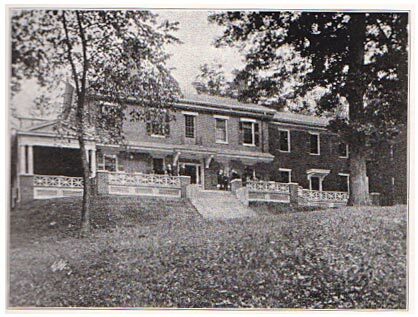 After occupying two smaller residence houses, the fraternity acquired the land and this house from the Oak Grove School on Lessey Street (King, 157). 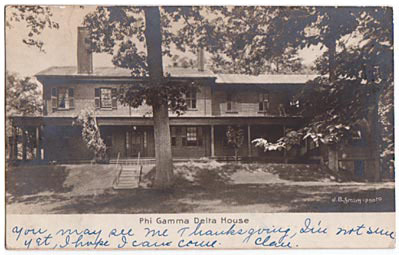 Olio showing the Phi Gamma Delta House after it was acquired in 1903 but before it underwent extensive renovations in 1929. 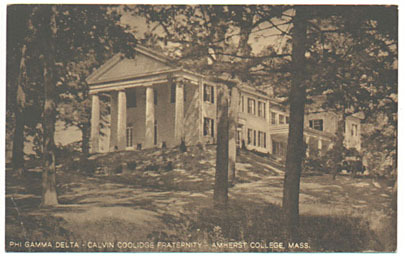 The postcard below labeled "Calvin Coolidge Fraternity" notes Governor and President Coolidge's membership. In 1957, according to notes in the Amherst College Archives and Special Collections, the chapter was suspended by the national organization, and became Phi Gamma Chi. In 1962, it became inactive, and on December 23, 1963, gave the house to the College. In 1984, the house became known as Marsh House, and is now the campus Arts House (A & SC, Buildings & Grounds Collection, box 6, folder 57).